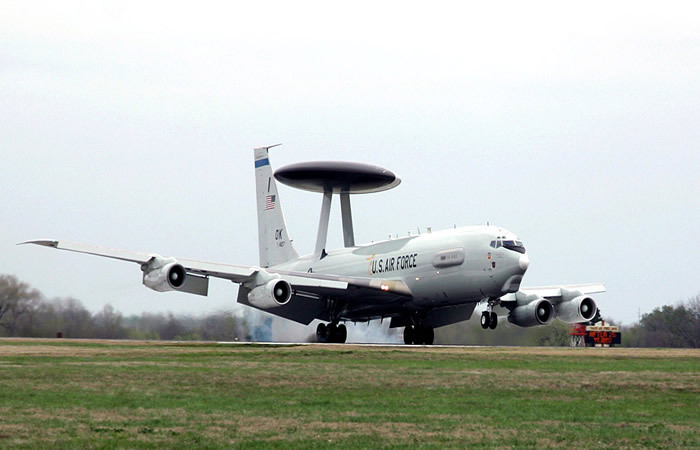 The E-3 Sentry is an airborne warning and control system (AWACS) aircraft provides all-weather surveillance, command, control and communications needed by commanders of U.S., NATO and other allied air defense forces. The E-3 Sentry is a modified Boeing 707/320 commercial airframe with a rotating radar dome. The dome is 30 feet (9.1 meters) in diameter, six feet (1.8 meters) thick, and is held 11 feet (3.33 meters) above the fuselage by two struts. It contains a radar subsystem that permits surveillance from the Earth's surface up into the stratosphere, over land or water. The radar has a range of more than 250 miles (375.5 kilometers) for low-flying targets and farther for aerospace vehicles flying at medium to high altitudes. The radar combined with an identification friend or foe subsystem can look down to detect, identify and track enemy and friendly low-flying aircraft by eliminating ground clutter returns that confuse other radar systems. 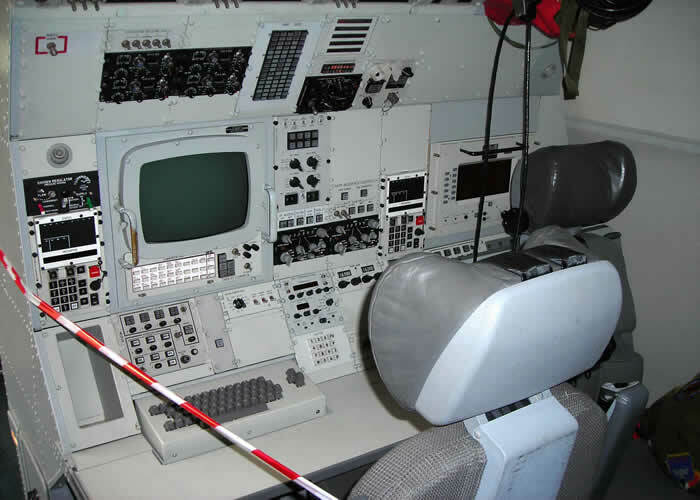 The radar and computer subsystems on the E-3 Sentry can gather and present broad and detailed battlefield information. Data is collected as events occur. This includes position and tracking information on enemy aircraft and ships, and location and status of friendly aircraft and naval vessels. The information can be sent to major command and control centers in rear areas or aboard ships. In time of crisis, this data can be forwarded to the president and secretary of defense in the United States. It is a jam-resistant system that has performed missions while experiencing heavy electronic countermeasures. With its mobility as an airborne warning and control system, the Sentry has a greater chance of surviving in warfare than a fixed, ground-based radar system. Among other things, the flight path can quickly be changed according to mission and survival requirements. The E-3 can fly a mission profile for more than 8 hours without refueling. Its range and on-station time can be increased through inflight refueling and the use of an on-board crew rest area. Engineering, test and evaluation began on the first E-3 Sentry in October 1975. 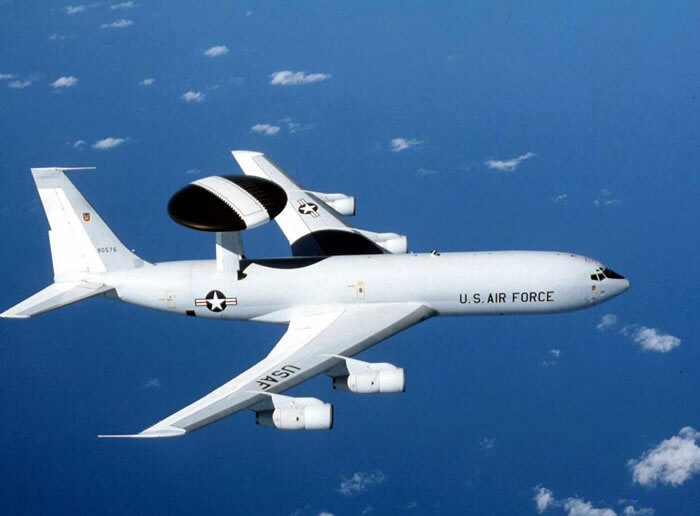 In March 1977 the 552nd Airborne Warning and Control Wing (now 552nd Air Control Wing, TinkerAir Force Base, Okla.), received the first E-3s. Air Combat Command has 28 E-3s at Tinker. Pacific Air Forces has four E-3 Sentries assigned to the 961st Airborne Air Control Squadron (AACS), Kadena AB, Japan and the 962nd AACS, Elmendorf AFB, Alaska. There is also one test aircraft at the Boeing Aircraft Company. NATO has acquired 17 E-3A's and support equipment. The first E-3 was delivered to NATOin January 1982. The United Kingdom has seven E-3s, France has four, and Saudi Arabia hasfive. Japan has four AWACS housed on the Boeing 767 airframe. 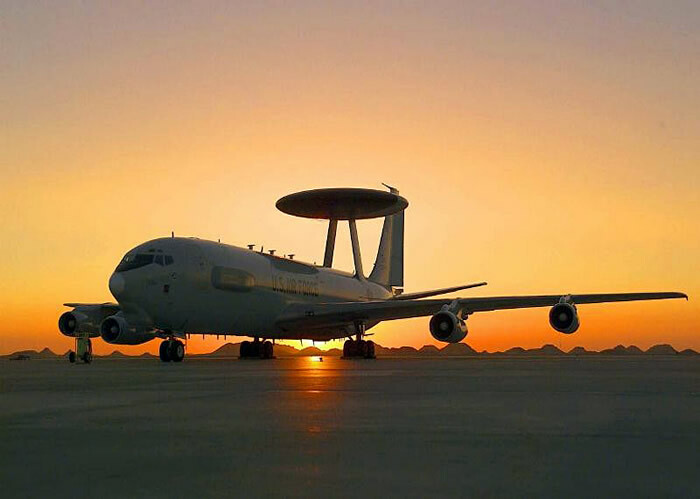 As proven in operations Desert Storm, Allied Force, Enduring Freedom and Iraqi Freedom, the E-3 Sentry is the premier air battle command and control aircraft in the world. 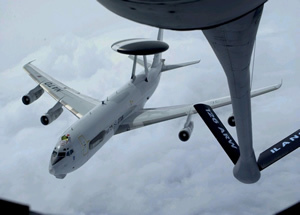 AWACS aircraft and crews were instrumental to the successful completion of operations Northern and Southern Watch, and are still engaged in operations Noble Eagle and Enduring Freedom. They provide radar surveillance and control in addition to providing senior leadership with time-critical information on the actions of enemy forces. 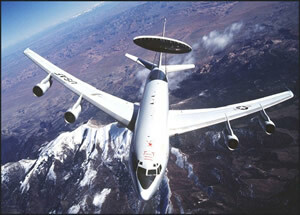 During the spring of 1999, the first AWACS aircraft went through the Radar System Improvement Program. RSIP is a joint U.S./NATO development program that involved a major hardward and software intensive modification to the existing radar system. Installation of RSIP enhanced the operational capability of the E-3 radar electronic counter-measures, and improved the system's reliability, maintainability and availability.